Posts related to Rob’s participation in the Society for Creative Anachronism. One of the best parts of this profession is getting to meet all sorts of creative people. J. Edward Neill is one of those people. I really enjoy his covers, and I think 22 May is the perfect day for me to interview him here. What is your quest? To seek the Grail…of full-time creativity! I’m an author and artist, and my subject matter varies wildly. For my books, I like my readers to enjoy vivid, approachable stories while maybe…subtly…encountering moments of introspection. Meaning, I like to dip into philosophical discussions without anyone really knowing it. As for my art, I prefer to explore darker themes. Beauty coupled with death. Peaceful suffering. Unholy deathpunk machine demons. You know…the usual. What is the average flying speed of an unladen paint brush? Time, time, time. There’s never enough of it. In trying to balance writing full-length novels, creating philosophy handbooks, painting every night, and enduring the perils of single-fatherhood, I find myself permanently stretched. If I spend too much time writing, I crave to pick up a paintbrush. If I fall too deep into a new canvas, I beat myself up for not hammering out more words. And then there’s my son, who just wants to sword-fight in the backyard. He always gets to be Link. I’m just a lousy Bokoblin. What are the powers of your personal Holy Hand Grenade? I’ve definitely (along with my art-partner) achieved some pretty cool successes with 3D art. Our styles, whipped together in a blender, are both light and dark, beautiful and terrifying. Last year we spent about a month sculpting and painting a giant, futuristic robot-spider hanging inside a web of machinery. It was exhilarating to finish! As for my books, I think I’ve struck a chord with my Coffee Table Philosophy books. I researched these, quite literally, by going to various Atlanta bars and asking tipsy strangers to answer philosophical questions. The results were…well…interesting. Crunchy or Creamy? Crunchy. I like my food to break beneath my teeth. Favorite Sports Team? Chicago Cubs. 2016, baby! Cake or Pie? I’m a cake guy. Marie Antoinette speaks to my soul. Lime or Lemon? Lemon. Especially Chik-Fil A lemonade, aka diabetes in a cup. Favorite Chip Dip? Queso with mega-spicy jalapenos. Wet or Dry? I’m an ocean lover. Despite the jellyfish. Wet. Favorite Musical Performer We’ve Never Heard Of? Robert Rich. He makes these trippy, gloomy soundtracks. Absolutely perfect to paint by. Whisky or Whiskey? Scotch whiskey. The older, the better. Balvenie 21 Port. Steak Temperature? Medium. But really, I’ll eat any steak in the world if there’s scotch involved. Favorite 1970s TV show? Was Lost in Space from the 70’s? I can’t remember. Winter, Spring, Summer, or Fall? Fall. I like to enjoy long runs in the woods with the leaves tumbling all around me. Favorite Pet? 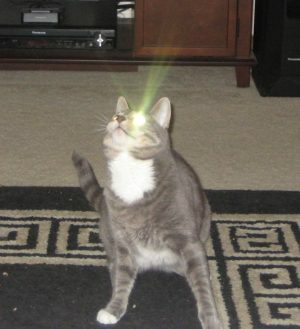 Sticky, the laser-eyed cat! Coffee or Tea? Tea. Strong and sweet. Sci-Fi or Fantasy? Oooooo…tough question. I’ll go with fantasy, if only because the possibilities are even greater. What question(s) would you like to ask me? I’m looking at your website, and I’m thinking you might like to LARP. True or false? My Answer: One might make the case that there’s little distinction between LARPing and the SCA. And the case would be a good one in many ways. This year marks my 20th anniversary of joining the SCA, and it has helped me grow, including as a writer. I have done very little of actual LARPing, though I did get to help run one at GenCon in the 90s. I was a designated NPC, and at one point they told me to “die interestingly.” So, I died half-on, half-off an elevator. And then they did the body tape thing. People who were just in Milwaukee, not there for Gen Con, got to the hotel elevator and there was half a body silhouetted in tape. The rest was on the 4th floor. Also, I’d love to know your answer to this— if you could lock any two historical figures (dead or alive) in a cage for a fight to the death, which two would you pick? My Answer: Wow, that’s a fascinating question. Here’s an answer, related to your interest in philosophy. Let’s go Hammurabi and Justinian in a duel of legal wits. But man, there’s so many fun choices. Tell me again where we can find your stuff? And Where can we find you? DragonCon 2018, baby! Come see me at my table. Also, Pancakes & Booze Atlanta in July. 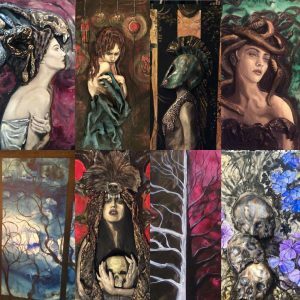 Eat free flapjacks, get tipsy, and buy my terrifying paintings! Final question for you: What should I have asked but did not? You should have asked: If you had to choose one creative outlet, and only one, which would it be? So I could answer: Painting. Late at night. Alone in my dungeon-like basement. With music playing and a too-strong cocktail on the table. You should also have asked: What have you done recently? 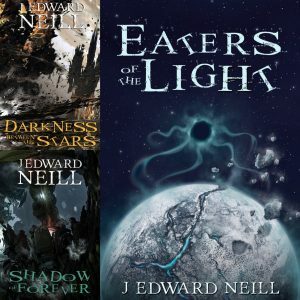 And I would answer that I’ve very recently finished up my big fiction trilogy – Eaters of the Light. Each cover was created by Amanda Makepeace, whose interview introduced me to you. This series will appeal to lovers of both fantasy AND sci-fi. Space vampires, holographic blue girls, and intergalactic heartbreak. It’s available now on Amazon. Thanks for reading. If you’re interested in any of the other interviews I’ve done, you can find them all here: http://robhowell.org/blog/?cat=326. If you are a creator, especially an independent creator, and you want to be spotlighted in a future interview, email me at rob@robhowell.org. Also, if you want to join my mailing list, where I’ll announce every interview, as well as what’s going on in my life, go to www.robhowell.org and fill out the form (Name and Email Address) or drop me an email and I’ll add you. I’m back and mostly recovered from Gulf Wars. From a professional point of view, it was a productive time. I got lots written. I’ve finally broken the 50k barrier in Brief Is My Flame while tossing some towards None Call Me Mother. I also sold enough to pay the gas and site fee. With this success, I made some new plans to expand my merchanting by getting my own booth at Gulf. I’m excited as it’s another step forward for me. However, I did not have as much fun as I have had at such events before. These two things are not unrelated. Basically, I came home from fairly long days and simply didn’t have as much energy as I wished to participate in the fun. Mostly, this was because I was so tired of talking to people that I needed to retreat. Next year I’ll have my own spot, which will hopefully make things go a little smoother since I won’t be juggling two different camps. I won’t be on the corner in Calontir, but frankly, when I got home after working I wasn’t able to do the job of welcoming people to Calontir properly anyway. I’ll miss that spot, which I’ve occupied for the past fifteen years or so, but it’s time to move on. I’d been contemplating expanding my wares to include stuff on consignment, other books, CDs, stuff we’ll make when we get a shop, and things that Giulia wants to make. By July I hope to have enough to sell to reasonably fill the front of my pavilion. Over the past few years, Master Andrixos, the greatest trim monger I know and the owner of Calontir Trim, has greatly helped me. He’s taught me much of what’s involved in being a merchant and he’s done me any number of favors. I can’t thank him enough for his help. But it’s time for me to have my own home at most events. Today’s quote is how my life seems as my professional life adapts alongside the personal one. I see a great future, but I have to muddle my way through the present. Nothing new but check the blog on Tuesday as I’ll be adding a recurring feature. Let me know if you have any suggestions on the website, this email, or cool story ideas at rob@robhowell.org. Especially let me know of suggestions you have for the Spotlight section. I’ve been at Gulf Wars all week long and it’s been, as usual, productive. I spend the day in Calontir Trim writing and talking to customers. I sell pretty well, and I get lots of words on the page. Today has been a little slow, though, as I shut down the Calontir Party last night. I might have needed a nap. We’ve another day and a half of sales, then hoping to pack out on Saturday. We’ll see though, as the day tends to be really long. If I can do it, though, I can get to Hattiesburg, maybe even Jackson, and Sunday’s drive is much easier because I start earlier with a good shower. As with all wars, it will be good to get home and see my sweetie. These events are lots of fun, and, as I’ve already said, productive, but they are also exhausting. Current Playlist Song: None, actually, as I’m sitting in a tent listening to the wind blow the canvas and people having fun stepping out of time. I wrote this snippet a few weeks ago and it’s part of Brief Is My Flame: http://robhowell.org/blog/?p=927. That’s Sveinn’s song I’m singing. Saturday, one of my favorite people was elevated to the Order of the Pelican. For those not in the SCA, the Order of the Pelican is a peerage order at the same level as the a knight. However, instead of prowess at arms on the battlefield, the Pelican is chosen for their hard work and service to the SCA. They serve as officers, run events, organize projects, and whatever else needs to be done at a high level. By the way, the other bestowed peerage orders are the Chivalry, which is someone who has great prowess with rattan fighting, the Master of Defense, which is someone who has great prowess with steel fighting, and the Laurel, which is someone who has great prowess with an art or science. There’s also the Royal Peer, which is someone who has served as royalty in the SCA. A person can earn the right to be a member of any or all of these orders. For those who don’t know Conna, I hope someday you get to meet her. She is one of the sweetest, most helpful, and talented people you could ever meet. I was honored and excited for her sponsor, Elasait, to choose me to write the ceremony. One reason she chose me is that I am currently the Lanner Herald of Calontir, which means I’m to help make sure ceremonies happen. I took this job in part because I love ceremonies, which is why I took such pleasure writing the funeral in A Lake Most Deep and the stepping down ceremony in I Am a Wondrous Thing. I also took this job because I wanted to make ceremonies more interesting and fun. Conna’s ceremony is an example. It dawned on me I’ve never really talked about how I shape ceremonies and what I think about when I’m writing them. With Conna’s permission, this post is an annotated copy of her ceremony that people who have always been interested in ceremonies can perhaps use as a reference. Many kingdoms have a set standard for each ceremony, but I am not a fan of that. I aim to make every ceremony special for the recipient, because it is their day in the sun. However, the first rule is the ceremony is for the recipient, not for me. My job is to give them or their sponsor interesting options, but if they want something standard and vanilla, they get it. Like when I write scroll texts, I want to shape ceremonies around the recipient’s persona. It would be odd for a Norse persona to be given a ceremony that is appropriate for the Hundred Years War, and vice versa. So, my first step is to find out, if I don’t already know, what time and place they like so I can focus my research to match. Determining the time and place for Conna was easy. I drew upon the writings of Alphonso X, the Wise, King of Castile from 1252 to 1284. Alphonso is one of Conna’s great inspirations. She’s studied his writings and, especially, the many cantigas he wrote. Taking from his work would be very powerful for her. Even for those I know well, I always start by asking their sponsor a number of questions, not just the time and place of their persona. What does the recipient want? What are their likes and dislikes? Hopefully, I’ll find out some inside jokes. I’m looking for anything that makes the ceremony more personal. Again, for this ceremony, that proved easy. Elasait said to me she wanted to retrieve the protege belt she gave to Conna years ago. For those not in the SCA a protege is to a squire what a Pelican is to a knight. Each bestowed peerage has the opportunity to take students and guide others in the SCA in what they’ve learned. A token, usually a belt, is given by the peer to the student to show the connection. If a squire is elevated to the Order of Chivalry, part of the ceremony includes a moment where the squire returns the tokens showing their station as a student to the knight. However, if a squire, such as myself, is elevated to a different order, like the Order of the Laurel, he or she has the option of keeping the tokens and remaining a student of the peer, or returning the tokens to his former peer. This is a completely personal choice. I gave mine back to Fernando when I was elevated. Conna chose to keep hers ten years ago when she was elevated to her first peerage. So Elasait wanted to make sure that was in the ceremony, and that gave me the hook. This is often one of the greatest challenges of a ceremony. Very rarely in Calontir does a peerage ceremony happen without everyone in the audience knowing it’s going to be a part of that court. Many people will know who is sponsoring the candidate and know when that person is called into court that the elevation ceremony is beginning. In general, ceremonies are formulaic, so again most people know what’s going to happen in general terms. The sponsor will come up, ask to elevate the candidate. The candidate and the order to which they will join are called up. Also called up are the speakers in the ceremony and close family members. The speakers will talk about the candidate to the Crown, who will confirm that the candidate should be elevated. Then, the accoutrements of the order will be bestowed. The candidate is dubbed, swears an oath of fealty, and the scroll is read. There are some specific differences, like the buffet for the Chivalry and the different accoutrements to each of the orders, but that’s the basic structure. Hence, it’s almost impossible to make ceremonies completely different from each other. One of the places you can make a ceremony unique is to find a way to start the ceremony in an unexpected way. I’ve done a number of different things, but in this case Elasait’s requirement about the protege belt gave me the opening. Herald: Their Majesties grant the petition of Mistress Elasait ingen Diarmata. Elasait: Your Majesties, I come here to seek redress. I hesitate to name it theft, but there is one amongst your people who for over a decade has held something of mine and it is time that she finally return it to me. Damien: This is a serious charge. Who do you thus accuse? Elasait: I accuse my protégé, Mistress Conna ingen Ui Chearbhaill. You’ll see the first line is the most common way we start off ceremonies. The sponsor is granted a petition to speak to the Crown. Most often, they say something like “at such and such event, you granted my boon to elevate the candidate to this order, is it still your will to grant this?” There’s nothing wrong with that opening, but we do it all the time so I tried something different. Now, I’m a bad, bad man for suggesting this opening. However, it was something that no one who knows Conna, or for that matter, knows how ceremonies work, would expect. Elasait had to think about doing this for a few days, but in the end agreed that this would be a fun way to kick things off. And when she went into court she put on her stern teacher face and blasted it out. Fantastic job with that. As a side note you’ll see that I put all of the speaker’s names in the ceremony. There’s an argument to be made that I should use Their Majesties’ titles instead of their names, but this document is written to be a script, hence I’m focusing on making it as smooth as possible to perform. It’s easier to see your name than your title. However, since I don’t know who the herald will be when I’m writing it, I leave that in there. In the case of other speakers below, you’ll see both their role and their name. Again, I just put the name in, if I know it, or sometimes it’ll be both because the speakers get added in later. However it happens, the point is to make sure people can identify their part easily and quickly. You can see I use italics for stage movements and instructions, bold and underline speakers, and I always write them in 14 point Garamond. It doesn’t show as well here, but I put in extra white space to make the separate lines easily readable. I also put extra page breaks between sections so that, at least for the herald, they can move from page to page while other things are happening and it doesn’t distract from the ceremony. People often rewrite ceremonies to their own preference but I start it out with as much differentiation as I can to make it easier and quicker to read from while it’s happening. Getting back to the action, Elasait has just accused one of her best friends of stealing from her in court. I had spoken to Conna earlier in the day and knew she had no idea about the ceremony. So I knew to watch her face. It was priceless. The absolute last thing she expected. Yes, I am a big old meaniehead. Issabell: We grieve that such acrimony might exist between two peers of Our realm. Damien: And have you witnesses to support your claim? Issabell: Then I shall have my herald call them forward. Herald: Their Majesties call forward all who would bear witness is Mistress Elasait’s claim. This is even meaner to Conna, really, though it flows better arranging this as the next step. Conna was just bursting to come up after that start, but now she has to wait for all her speakers. It’s not terribly common for the speakers to precede the candidate, but there’s no real set order to get sponsor, candidate, speakers, and order up there. All that you have to do is make sure that all the people that need to get up for the ceremony know when they are supposed to go up. A note on the last instruction. Master David is Conna’s husband and I usually find a role such as banner bearer or speaker for husbands, wives, children, and parents if I can. If there’s no specific role, I still specify that they go up to where they can watch. They may not be needed for the ceremony, but I’m a sentimental guy. Anyway, let’s give Conna chance to participate. Damien: Herald, call the accused before us that she may defend herself. Issabell: Mistress Elasait, what item is it that you claim belongs to you? Elasait: When Conna was elevated to the Order of the Laurel, she deemed it improper that she then return the tokens I had given her as my protégé. I agreed only reluctantly that she keep them then, and the time has come for her to return these tokens. Damien: Why do believe the time has come? Elasait: Because I believe she has earned the right to be named a Pelican in her own right, and to put aside the tokens of a protégé forever. Issabell: Well-beloved is she, no doubt, but this is no small thing. We would have that Order advise Us and all such witnesses that might help. Herald: Their Majesties invite all members of the Order of the Pelican attending to join Them in Their court. As you can see, I’ve arranged that this ceremony will work like a court case. This legal structure is convenient for peerage ceremonies and I use it the vast majority of the time. The sponsor has a suit, brings it before the Crown, provides witnesses to attest to the case, and the Order serves as the jury. Obviously, we don’t get to the point of having a ceremony written if the decision hasn’t already been made, but it’s still a good way to structure things. Damien: Mistress Elasait, call your witnesses. This begins the section where all of the orders of peerage and the populace speak about the candidate. There is no set order for which peerage goes where, however, I believe that the order to which the candidate will be added should always go last to confirm all the rest. I usually have the populace go right before them. Other than that, I may just choose randomly or I may have a sequence of topics that works best. It’s just whatever feels right. Often, a ceremony will have a line that says something like: “Master Cooks-All-The-Feasts, will you speak for the Pelican?” There is nothing wrong at all with having the sponsor or the Crown saying this. In fact, it’s sometimes easier because everyone gets an explicit cue that it’s their turn. I will often try to avoid it, though, because if we prepare the speakers well (“you go after Mistress Pointy-End-In-The-Other Guy”), it’s not that difficult to arrange. By excluding the prompting lines, you speed up the ceremony a bit, and that’s sometimes really nice, especially in courts with multiple ceremonies. You’ll also note the most important part of making every ceremony different. It is also the part that takes the most time to create. This is my basic structure of what the speakers are told to say: <own words, suggested topic – cool stuff related to the persona here >. The people chosen to speak are close to the candidates. They love them. They want to put that love and friendship into words. This is not something you can script. However, you can give them guidance and inspiration. Oddly, it doesn’t take much to make a ceremony feel like it’s from a particular time and place. If most of the speakers reference something of the time and place in the midst of their words, that adds the spice that makes the ceremony taste Norse, Hundred Years War, Pictish, Persian, Japanese, or whatever. I do the research to find relevant prompts, but it is up to the speaker to use any or all of that information. Again, this is a very personal moment and speakers need to have the freedom to show their heart and it only takes most, not all, of the speakers tossing in that spice to flavor the pot. As I said before, Conna’s focus of interest is Alphonso X. I chose to pull from his Siete Pardidas for the witnesses and, as you’ll see, the Estoria de Espana for the bestowed items. These just felt right. I tend not to overthink things when I’m looking for inspiration, especially in an area where I’m not an expert. If it sounds cool to me, I put it in my notes and see if I can fit it into the ceremony. As a side note, when I’m looking through the texts of the period, I cut and paste out more passages into my notes than I’ll need. Sometimes a passage doesn’t work and needs replaced, or you need another one because there’s an extra speaker or seven. It’s nice to have a little extra just in case. Issabell: Mistress Elasait, well have you proven your case. Damien: We deem that Mistress Conna must return to you all tokens that show she is your protégé. How do I choose which passage goes with which peerage? Again, whatever seems right. I’ll cut and paste and read it, then cut and paste a section to a different spot and so on. I said before that ceremonies have a basic form and that’s to have speakers of the orders and the items. There’s another type of speaker that might be added, and those are speakers of the chivalric virtues. It is rare for me to write a ceremony that has speakers on the virtues and speakers from the orders and speakers on the things. That’s simply too many speakers, and peerage ceremonies are already long. I’ll do it, if the candidate specifically requests, because it’s about the candidate, but I’ll advise against it. What I’ll suggest instead is that the speakers of the orders and the speakers of the items be prompted with references to the virtues. Something like, “I am Sir Hits-Things-Hard, and I will speak on Prowess,” and “I am Mistress Makes-Cool-Stuff, I bring the medallion, and I will speak on Courage,” and so on. That way we can have the virtues included, which many candidates want, and yet not have extremely long ceremonies. Anyway, we have come to the end of the court case portion of the ceremony. The case has been proved to Their Majesties satisfaction, and we move on to the actual elevation portion. You see that in this case, we remind the crowd of the nature of the case by ensuring that Elasait gets that belt back. Hugging will usually ensue when the belts get returned. I put in the stage direction about the hugging so that everyone involved is reminded to let that happen. We all know it’s going to, but sometimes on stage we get too focused on what comes next so it’s just a mild bit of humor people reading the ceremony see that suggests a break in the moment. Issabell: Mistress Elasait, have your claims been fully redressed? Elasait: No, Your Majesties. For though I brought suit against her, she is yet dear to me and I would give her gifts for you to bestow that befit her new station. Elasait: Alphonso X said a kingdom consists of three main parts. I give you gifts that you always recall each of them. Damien: These are wise words indeed. We would have you remember them, now and forever. Issabell: You are accoutered as a Pelican. All claims against you are resolved. Now, it’s going to come as complete shock but Alphonso X did not, actually, write about Calontir at any point in time. Clearly, a failing on his part. However, I’ve included Calontir references in these item speeches nonetheless. I simply paraphrased Alphonso with a Calontir twist. Again, these notes are there to give the speakers ideas, not exact quotes. I obviously include the sources, though. One, I feel like I should as a researcher. Two, it’s also important that the speaker can track down the source, if they want, to find out the context. Some speakers do extra research. Some don’t. Doesn’t really matter, you’ve given them something to work with and a route to go if they want more. As for the specific items, there’s a base list of items which each peerage gets. This base list can be modified and some of the items are optional. For example, I did not want someone to make me a laurel wreath when I was elevated because I would never wear it. Why waste someone’s time and money? There are times as well that a certain type of item doesn’t really fit a persona, so the item becomes something similar, like in Conna’s case a veil instead of a cap. In cases of a second peerage, as in this case, the coat is often modified to reflect the second peerage. These are things that the sponsor arranges and either they tell you the changes ahead of time or, as in this case, edits the ceremony themselves. Damien: Accept then from our hands that which your devotion and service have brought you. May your skills ever be increased and offered in service to Crown and Kingdom. May your courtesy and gentle demeanor ever serve as an inspiration for those who would observe you. And may your spirit ever follow the goals your heart has set before you. This is the dubbing, and it’s a basic formula. I rarely change this part, but it is something that could be changed. It might be something that a particular Crown decides to change for all of their peerages, like they change the oath to suit their time and place. However, this is a pretty good set of words and is the standard. Issabell: Are you now prepared to swear your oath as a Pelican? To take you as liege of life and limb and truth and earthly honors. Of the Crown, the Kingdom, and the Society. that We Will never sacrifice you needlessly. Your words with honor, and your deeds with justice. As part of their preparation to rule, Calontir Kings and Queens create the fealty oaths peerages and populace swear at Coronation. There are some standard oaths that are often chosen, but they can choose whatever they want. Because they’re doing the orders as a group, the oath is specific to the Crown. However, the oath for a peerage ceremony does not have to be the normal one for the reign and I will always look for an oath that matches the persona. Some Crowns prefer all to swear the same oath. Since this is Their court, the Crowns get to make this choice. Some sponsors and recipients also want to swear the normal oath. Again, if the Crown accepts, that’s the recipient’s choice. However, in my mind this is perhaps the most personal moment in the ceremony for the recipient and I at least offer an oath to match the persona, even if it’s not chosen. In Conna’s case, the oath was close enough to her persona I didn’t change anything. In contrast, when Severin received her Laurel later in that court, I made darn sure she got a Norse oath to swear because it meant a lot more to her than the normal oath of the reign would have. At this point, though, we’re basically done. Often I’ll put something here where the Crown announces something like, “Calontir, your newest Pelican.” Sometimes that flows well. Sometimes it doesn’t. Sometimes the Crown says it whether it’s in the script or not. It’s not terribly important either way. The crowd knows it’s about time to cheer for the recipient, and all they need is some sort of sign when to start. Another side note. It’s a little tricky for the herald to actually know when to start reading. In general, you need to let the cheering begin to die down before reading. Each second waiting for the right moment tests your patience, especially when Their Majesties are turning to look at you with a look that says, “Read the scroll NOW or I’ll get a woodworker to make stocks and a blacksmith to make locks,” but it’s better if it’s timed right even so. Scroll Text: If at all possible, put the scroll text in the ceremony. It will help the herald out. Again, we’re trying to make this a ceremony that is easy to perform. As you can see, there’s little for a herald to do after everyone is called into court until this point, but they must follow along prepared to prompt Their Majesties or a speaker if needed. By adding the scroll text in the ceremony, it makes it easier for the herald to read, or at least it has when I’ve been the herald. I’m not going to include the scroll text here because I didn’t write it, though I hope that they post it on Facebook or somewhere because it was really good. I also thought Elaisse, Ingeborg, and the performers did a fantastic job singing those portions. It was such a fitting thing for Conna. Well, there you have it. A blow-by-blow retelling of that miscreant Conna ingen Ui Chearbhaill getting called into court to get her just desserts. If you have questions about writing a ceremony or would like to volunteer to do so, just drop me a email at rob@robhowell.org and I’ll get you started. It’s been a good week. Lots of work on Eleonore’s portion of Brief Is My Flame, which is always fun for me. She’s one of my favorite characters. The only real problem with her is not having too many words about her. There’s no real way to write a full novel just about her in this sequence, but I easily could. One of the threads I’ve added that was not part of I Am a Wondrous Thing is Geirr Stronghair in Svellheim. He and Eleonore will have some interesting times together. On a different note, I may have found a replacement for Brewbaker’s. If you recall, Brewbaker’s in the Kansas City area was a bar that proved especially comfortable and productive. There’s a barbecue place in Council Bluffs that may prove just as productive a spot. And if it doesn’t turn out quite as well, I’ll somehow survive eating the ribs and pulled pork. And the brisket. Oh, the sausage balls are tasty too. It’s not quite B&C Creations in Wichita level of barbecue, but I’ll make do. Tomorrow, I will head to Calontir’s Toys for Tots Tournament. It’s a great event because of all the toys we gather. Always over a thousand. It’s definitely a cool thing to have Marines come into a medieval-themed court and accept the toys formally. For those readers not coming, which is most of you, I ask that consider finding a Marine and giving him a new, unopened, and unwrapped toy. It’s a good cause in my opinion. Well, I should get back to writing another battle scene. Have a great Thanksgiving everyone. One of the interesting things about writing is how much you have to honestly evaluate what you’re doing, and that’s hard. Imposter syndrome makes it hard to like what you’ve written sometimes, but at the same time each sentence is one of your babies. Don’t want to cut what is good, but nothing is good if you leave in the extra stuff. Rush, of course, helps me when I’m fighting through some of this, so we get this week’s quote. I hear this song and then I remember to distance myself from myself when I look at what I’ve written. I should probably just put this song on repeat when I’m editing. A seeeekrit project that I’ll open up in December. There you have it. Over 4500 miles, plus driving around cities. I went to two conventions, ConStellation and HonorCon and had a great time at both. My after action reports are at http://robhowell.org/blog/?p=856 and http://robhowell.org/blog/?p=862. I went to a big SCA event, War of the Wings. My report is at: http://robhowell.org/blog/?p=858. I saw lots of relatives, some of whom I’d never even known existed. I also met my cousins. I haven’t seen them since the 1970s. I need to make visits to the Carolinas more common so I can keep in touch. Neither ConStellation nor HonorCon are continuing as such, but I’ll go back to War of the Wings. I also toured the USS North Carolina in Wilmington, the USS Yorktown and USS Laffey in Charleston, and took the cruise to Fort Sumter. The North Carolina is the best battleship museum I’ve been to, and I’ve been on the Alabama (her sister ship), the Iowa, the Wisconsin, and the Texas. One specific extra cool thing on her is that you can actually go inside two of her 16in turrets. Tight quarters, but really neat to see. The Laffey was especially interesting, as I’d never been on a Sumner-class destroyer before. Also, I got fantastic pictures of the Yorktown as the cruise ship goes around her to get to Fort Sumter. Fort Sumter is a place everyone should go. It’s part of a series of forts that guarded Charleston harbor and it’s fascinating to think how one would try and attack the harbor. You see fairly quickly why Fort Wagner had to be taken, and this why the 54th Massachusetts was thrown against its walls as shown in the movie Glory. We had planned to take a more leisurely trip home, but by the end of HonorCon I was ready to get home. We drove the quick route back and did not visit Cape Girardeau on this trip as we had planned. The drive was generally smooth, though the really high winds and light snow on I-77 through the mountains north of Greensboro added a bit of difficulty factor. Overall, it was a fantastic trip. Mom and I had a great time, though it was exhausting. From a professional standpoint, I thought it went really well, even though I barely had a chance to write anything. I’m feeling the lack, because writing is like working out, if you do it consistently it feels better. But that’s what I’m ramping back up on since I got home. I’ve gotten a few thousand words in Brief Is My Flame, but I’m not yet back into form. That’s coming though, as I recover. Fortunately, there’s not much travel between now and January, so I can get back into the rhythm. Whenever I’m on a long trip, I can’t help but think of William Least-Heat Moon and Blue Highways. If you haven’t read this book, go do so. It’s a fantastic read, with all sorts of philosophical thought, history, and a sample of 1970s America. The second thing on this trip was War of the Wings, an SCA event in Atlantia. I am glad I get to do what I do, but sometimes the effort required can make things challenging. Once again, I have to thank Master Andrixos for letting me sell in his booth. I really enjoy spending time with Drix, and there’s no doubt he’s helped me get traffic. Now, traffic at the event for the merchants wasn’t as good as anyone hoped, and I suspect some of that is because they are still settling in with the best layout for everything. War of the Wings is a growing event, and the site is great, though tilted. However, they’re still fiddling with some stuff, including the best way to arrange the merchants. Sales were good enough that I’d like to go back if circumstances allow, but I think they’ll be better in the future. One thing that I think we’ll do differently is that both Drix and I will get separate booths, though we’ll ask to be next to each other. There are advantages for both of us to work together, including setup and tear down, but my logistics were a little complicated because my tent was so far away from the merchant booth. We’re going to try to be next to each other at Meridies 40th Year. While my camp was not close, I was blessed to be permitted to camp with Yorkshire Manor, one of the households in Atlantia. Included in that camp is Bryce de Byram, who is someone I knew well enough from Pennsics past to ask for space, but not much more. I said that the effort to do this job is challenging, and where that effort can be frustrating is my fatigue after work. Not just physical fatigue either, but also the fatigue of talking to people all day long. What that meant was my hopes to get to know the people of Yorkshire Manor better, especially Bryce, were foiled. I barely was able to spend any time with them. By the time I got home, I was too tired to enjoy the group, which was a shame. Many thanks to all of them, especially Bryce, Christian Thomas (who ran the camp), and all the people who helped make it a cool place. I’m sorry I didn’t do you all justice. As I said, I would like to go back, if circumstances allow. Now that I know how things are laid out, I think I can plan more efficiently, meaning I might have more energy to get to know some of those great people. Greetings all. It’s been a busy couple of weeks, and there’s some good news to report. Though I don’t have news on a house, we’ve managed to carve out enough space for me to have a cubicle I can work in from home. I haven’t had such a thing in months. I’ve been working on a series of small things, including some short stories in Shijuren. Also, I’ve made major progress on the website upgrade. I expect that to go live soon. That hasn’t left much time for Brief Is My Flame, but there have been bits and pieces here and there. Scenes, mostly, or snippets of conversation. I don’t actually know how many words, because they’re in a variety of places right now, but when I get back I’ll piece them together. Get back? Where is Rob going? Well, let me tell you. My mom wanted to see relatives in North Carolina, so we scheduled a trip in conjunction with cons and events. We leave tomorrow and wind our way to Huntsville, AL where I’ll be at Constellation. Then, we see a variety of relatives as we make our way across eastern Tennessee and western North Carolina. On Wednesday of next week, I’ll drop my mom off with relatives and end up in Boonville, where I’ll be selling books at War of the Wings. This will be a good chance for me to get my name out to a part of the SCA I’ve not spent much time at. Following that, we spend more time with relatives concluded by attending HonorCon in Raleigh. Whew. I’m gonna be tired in early November, I tell you what. But I’m really excited. I don’t know when I’ll get to see it, but I’m really excited about Blade Runner 2049. So, there seems only one quote that’s appropriate. Nothing new to add, but more will be coming during the trip. My story in For a Few Credits More involves a Peacemaker, but Peacemakers in the Four Horsemen Universe have their noses in all sorts of places. Kevin Ikenberry, who assisted me to make sure we were consistent, put out a full length Peacemaker novel. Here’s his author page on Amazon for the rest of his stuff: https://www.amazon.com/Kevin-Ikenberry/e/B00ASFBXT4/ref=dp_byline_cont_ebooks_1. Greetings all and welcome to release day! I want to thank Chris Kennedy and Mark Wandrey for letting me play in their sandbox. If you like military science fiction with mechs, this is the universe for you. Let’s just say the lieutenant finds enemies sitting where he did not expect. Anyway, I’m very excited to become a part of the Four Horsemen Universe, and hope to be allowed to contribute more. “Where Enemies Sit” has spawned a number of ideas for me that I will try and fit between writing in Shijuren. Speaking of which, I’ve done a little, but not much. With all the upheaval in my life, I simply haven’t written much. I’ve done a number of other projects, though, and have been clearing the decks of some assembled things that have also needed attention. I’ve got a series of SCA events to attend over the next three weeks. I’ll be at Queen’s Prize Tournament, which will give me an opportunity to visit with my apprentice. The week after, I’ll be in Grimfells with my booth. I’ll also be selling at the Gryphon’s Fest event. I hope to have copies of For a Few Credits More there, but it may take a while. With that, I’ll get back to work. Did about 2k words in Brief Is My Flame this week. Not much really, but I’ve been scribbling out and recording notes to hopefully make the writing much quicker when everything settles down. Last week I did my NFL prediction at http://robhowell.org/blog/?p=839. There are also eight other blog posts breaking down each division. They’re linked in this main post. I’ve put both of them here before, but this week’s spotlight again goes to Chris Kennedy and Mark Wandrey, whose Four Horsemen Universe is blowing up. In fact, over the next few weeks, I’ll be linking to other authors in For a Few Credits More. One of my favorite Pennsics ever comes to a close today. The weather has been incredibly nice. Cool, with only a little rain, and yet still lots of cloud cover. The merchant booth has been profitable, productive, and fun. I’ve had a great time singing, and got to see some wonderful things given to fun people. But at the end of two weeks, especially with packing in all sorts of stuff in the final few days, I must say I’m ready to be home. It’s been so busy here that I’ve barely had time to write, so I’m only about 10000 words into Brief Is My Flame, but since that means more sales, I am quite pleased. I’m also pleased where the story lines are going. Yes, I’ve done more plotting than usual, but that doesn’t mean the plot is static. As I did with Where Now the Rider, I’ll be steadily adding a few entries to the Wiki each week. I think these might be a little more revealing, though, as some of the new storylines are coming from different places. We’ll be exploring more of Svellheim, the Seven Kingdoms, the Western Isles, and the Kreisens, so we’ll all get to find out interesting stuff about those places as the plot takes me there. I love Shijuren. It’s a fun and interesting world and there’s so much more to come. One of my favorite aspects of Pennsic, and the SCA in general, is the opportunity to sing at bardic circles. This week’s quote comes from a Kipling poem which we have turned to song. When once he has pledged his word. I watched Consortium of Genius perform at ConFluence. They were a lot of fun and surprisingly metal. Most bands at SF/F cons are acoustic in nature, but these guys played their music loud and hard. I had a blast, though I think some of the other people were a bit bemused. I especially enjoyed Think Tank and Middle-earth Needs Me.